You are currently browsing the archives for the tag 'Big Bang Meca-10 P2P limited edition watch'. HUBLOT has always pushed the boundaries of traditional watchmaking industry. This year, the watchmaker is celebrating ten years since the creation of Bitcoin by launching the brand-new Big Bang Meca-10 P2P limited edition watch, available for purchase exclusively online with Bitcoins and also featuring the transaction number engraved on the edge of the bezel, rendering each piece unique. Bitcoin was created only just ten years ago in November 2008. This famous cryptocurrency, a virtual asset stored in digital form, was invented by Satoshi Nakamoto, a name used by the mysterious person – or persons – whose identity remains a mystery to this day. In any case, the peer to peer – P2P – payment system has attracted a large following of users and investors accepting payment for their transactions. 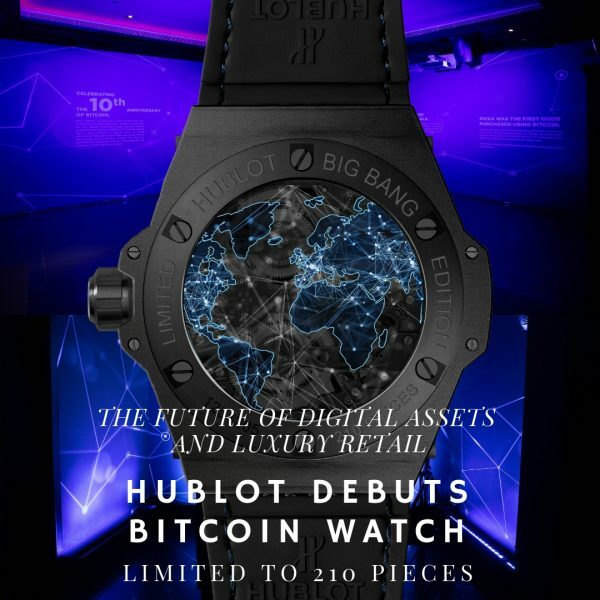 A trailblazer in new technological and societal trends, Hublot has decided to mark the ten year anniversary of Bitcoin by launching the first watch that can only be purchased using Bitcoin. It will be sold exclusively via e-commerce and can only be ordered and paid for online. 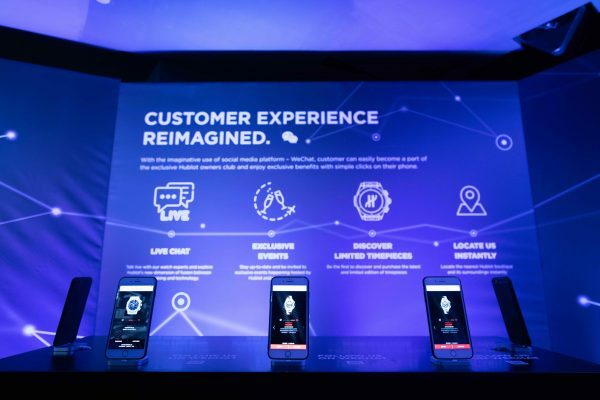 Such innovation was made possible through a collaboration with OS Limited (OSL), Asia’s leading digital asset brokerage. 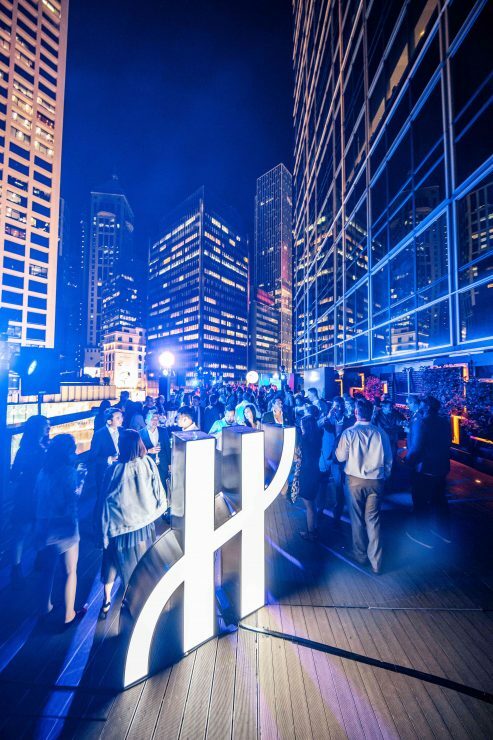 This makes Hublot the first big watchmaking brand to enter this sector. True to the innovative design expected from the Big Bang collection, the “P2P” watch has a 45 mm case made from microblasted black ceramic. 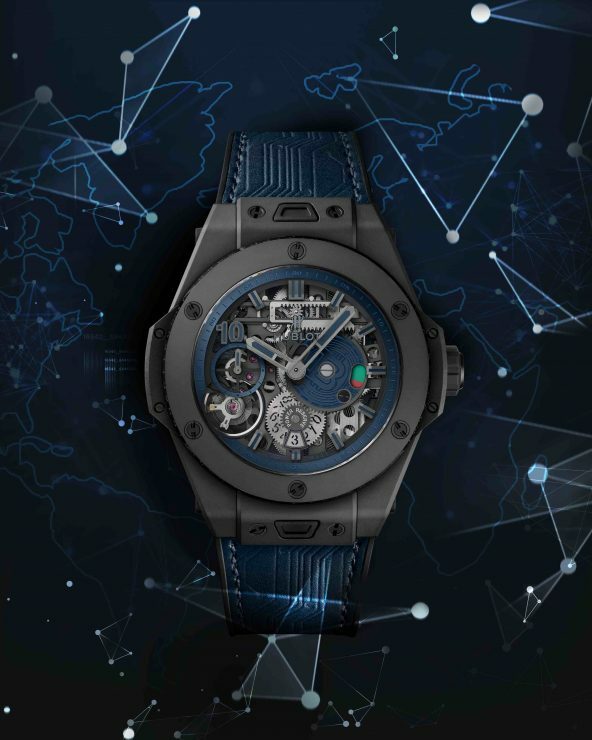 When we talk about ceramics in a Hublot watch, this does not mean clay-based pottery, but rather a high-tech material of zirconium dioxide pressed at a very high temperature. 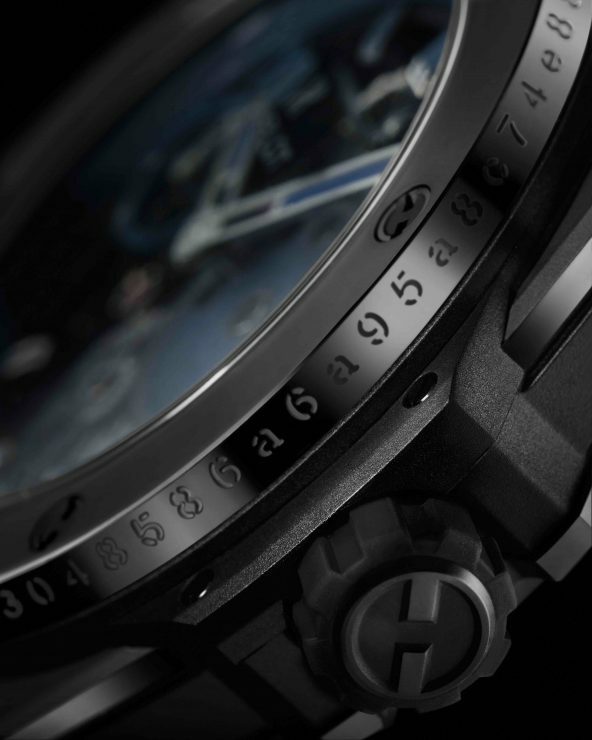 The Art of Fusion that is so dear to watchmakers and engineers at the Nyon manufacture. It houses a HUB1201 manufacture calibre, a skeleton movement offering an exceptional 10-day power reserve. A number that was not chosen at random: Ten to mark the number of years the Bitcoin has existed. Each of the 210 pieces is unique: Manufactured for its wearer bearing the identification number of the transaction made via Bitcoin. Another reference to cryptocurrency can be found in the Blockchain inspired design – the interconnection network of computers on which virtual money works – on the blue calfskin leather strap which is lined with black rubber. The Big Bang Meca-10 P2P was presented a few days ago in Hong Kong, where OSL headquarters is located. 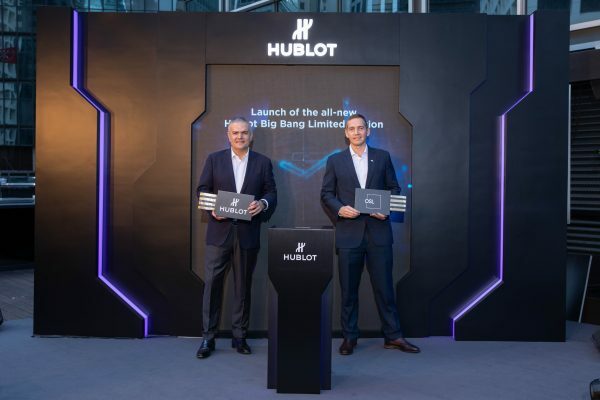 Ricardo Guadalupe, CEO of Hublot, greeted special guests at an event of technological splendour. 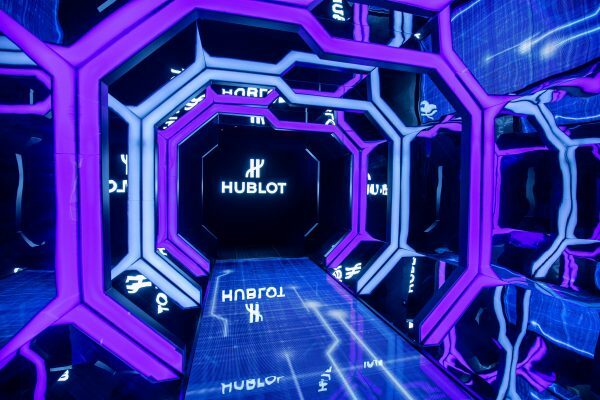 Visitors entered through a captivating tunnel with an interactive display showing the world of cryptocurrency, and the unique payment system that enables Hublot to accept payment in Bitcoin. A revolutionary milestone in the watchmaking world! YOU CAN ORDER THE HUBLOT BIG BANG MECA-10 P2P HERE.